“Das nie geschaute Land” is a typewritten manuscript from 1994 edited by Hans Wolfram von Hentig. 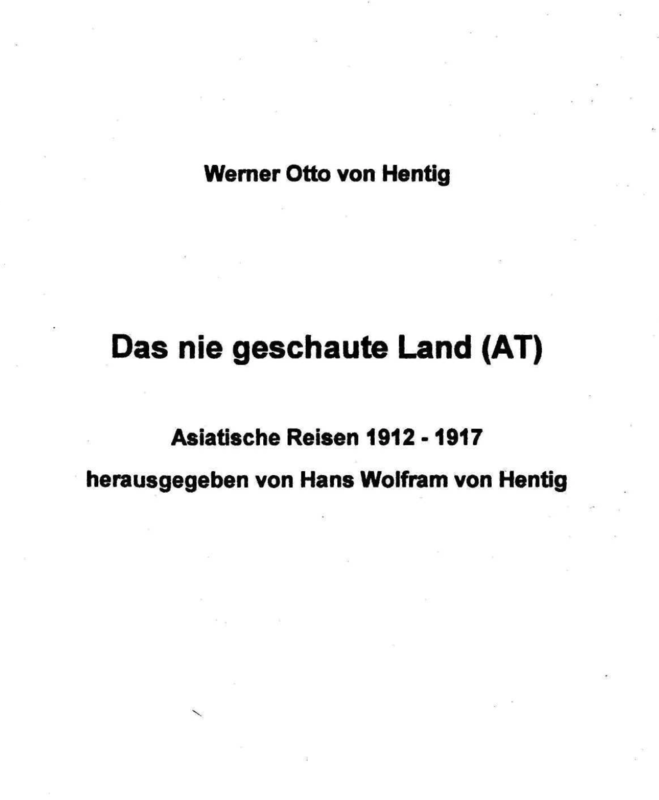 It is a compilation of texts dealing with the travels of his father Werner Otto von Hentig in Asia during five years at the time of World War I. The German diplomat Werner Otto von Hentig (1886–1984) was commissioned by his government in April, 1915, to take an Indian Raja to Afghanistan and help him mobilise the Emir in Kabul and his kinsmen against the British in India. On their way to Afghanistan from Berlin via Constantinople, Aleppo and Bagdad across the Kewir Desert in Iran, Hentig did not keep a diary due to the fact that they were surrounded by enemies and thus ran the risk of being caught and searched. Instead, he wrote an account of this journey in June 1917, when he was back from his mission. In the abovementioned manuscript, his account is completed with letters to his parents while he was travelling and with excerpts from his memoirs. Even though they stayed in Afghanistan for more than one and a half years, the Hentig mission failed and the delegation was dissolved. Hentig rode off from Kabul in May 1916, leaving behind not only the Indian Raja, who had proven to be a rather troublesome character, but also his own documents, which were to be dispatched to some “Herr Wagner” in Herat, never to be found again. The manuscript was published in 2003 under the title of Von Kabul nach Shanghai: Bericht über die Afghanistan-Mission 1915/16 und die Rückkehr über das Dach der Welt und durch die Wüsten Chinas, with a preface by the then late Gunnar Jarring, who must have written his contribution on the basis of the manuscript still to be found in the Collection at SRII/Istanbul. The major part of the Istanbul manuscript (pp. 59–169) is comprised of a diary written by Otto von Hentig between 21 May and 25 December 1916 on his way back from Afghanistan across the Pamirs through Eastern Turkestan, where he met and received help from, among others, Swedish missionaries in Yarkand and Kashgar. The original diary, written in shorthand, was taken away and lost, as von Hentig was seized and imprisoned by the Americans after World War II. What remained for his son, the editor, was a copy of the diary interpreted and typed by his father shortly before his imprisonment in 1945. The title of the 1994 manuscript in the Jarring Collection at SRII/Istanbul, “Das nie geschaute Land”, does not, as one might have expected, refer to Afghanistan but to Pamir/Hindu Kush along the route chosen by Hentig for his return to Europe, across Eastern Turkestan and China. This was stated explicitly by Hentig in his memoir Ins verschlossene Land, about the same mission.